In a lifetime definitely it could happen at least once. Maybe you are alone, or with your friend, or with your kids, and you go home in Simi Valley or go to your car. It’s almost a perfect day, but then you realize your keys are missing as you reach in for your pocket or your bag or your purse. Panic sets in. Your mind scans about the places you have been, the last moment you have seen your keys with you – then you think about whether it fell or was left behind elsewhere. You could not go inside the comfort of your home. You could not leave the place with your automobile. If the search for the keys is futile, what then could you do in an emergency lockout in the middle of California? Of course violently thrashing the locks, the knobs or the windows to gain access is not a good option. That is plain desperation. Unless you could pick your own locks like a professional rogue, it would be better to hire a professional who is not definitely going to be a rogue on your property. That non-rogue professional is the mobile locksmith; or in a very anxious case he or she is also called an emergency mobile locksmith that comes to the rescue. 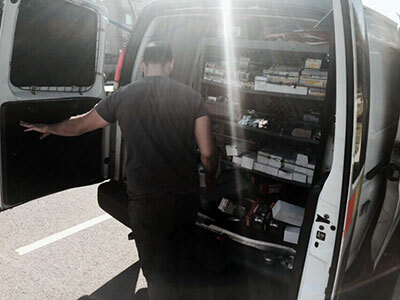 A mobile locksmith service provides a team of specialized technicians that could tackle residential, automotive or commercial ‘lock and key’ mechanisms. Their availability is 24 hours round the clock, for each day of the year, even on holidays. So all you need to actually do is to call them and describe your situation. The mobile locksmith company will immediately deploy their technician suited for the job. Usually they also just go for only one trip because they could fix your problem as soon as possible. For example you got stuck outside your house in Simi Valley and you did not have the opportunity to have a spare key hidden under a pot or somewhere. Instead of destroying your doorknob, just call the mobile locksmith and they could either: provide a key replacement by cloning your key depending on the door, or provide a new set of mobile home locks to replace your current lock without a key. But the mobile locksmith service is not just being able to work out of a vehicle when a problem arises in a nearby area. A lot of locksmiths are also capable of working on any door hardware and not just the locking mechanism. So even you door hinges, closers, frames and even electric strikes – a mobile locksmith could also do that for you. If you also suspect some form of foul play over your locks, then they could do some form of preliminary investigation as to what has happened to your lock and key mechanism at home or at your car. So when that uneasy situation comes up again, just be sure to contact your 24 hour mobile locksmith! You will sure have easy access again to your home and car in no time.